Welcome to Circle S Leather. We are a family run business. We work out of our home and a small shop. Because God has blessed our business, over the last 15 years our braintan has sold in 46 states and 13 countries. 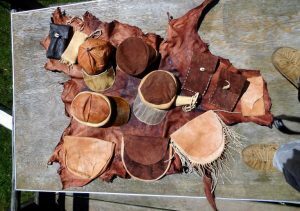 We have a wide variety of customers: Native Americans, reenactors, tailors, musicians, bead workers, quill workers, and other talented folks who all like the unique characteristics of quality braintan. 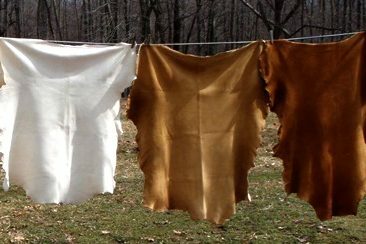 Braintan is an ancient method of tanning hides that involves dressing a raw hide with brains, (or other natural emulsified oils) softening it with manual labor to produce soft buckskin and smoking it to preserve the softness. Some version of braintan was produced in nearly every part of the world, at some point in history. Here in America, when we think of buckskin, the first thing that comes to mind are the native plains tribes with their long, graceful fringe. And with good reason. Buffalo, deer, antelope, bighorn sheep, and elk hides clothed them, and provided their shelters in the form of hide Tipis. 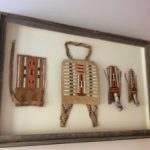 But did you know that buckskin was also worn by those on the Lewis and Clark expedition, the trappers (mountain men) of the 1800s, and settlers in both the east and west? When they harvested their meat supply, they gained the raw materials for their clothes. All they needed came with the animal, except for wood smoke and a few simple tools. 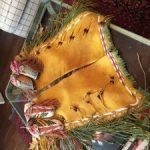 If you wish to examine our buckskin before buying, free sample scraps less than 2 inches are available. Please email us your address to receive a sample. On this site you will find pictures of our brain tanned buckskin, a few products we create, customers testimonials, and check out the blog page for braintanning tips. Enjoy your visit and come back often to check for updates. 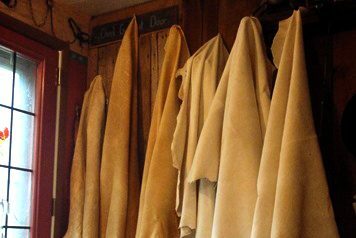 Average deer hide is around 10 sqft. 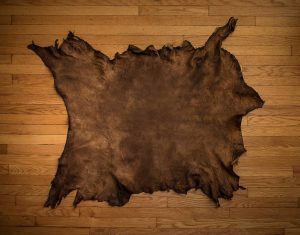 Average elk hide is around 20-25 sqft. Send us your ideas and we’ll do our best to create a bag that reflects your personal style. We can also custom make the following items: Purses, cell phone bags, and book covers. The middle bag in each pic was made by Loren and Liza and the other bags are made by the customer. 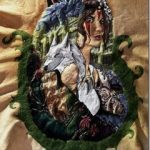 We make the bags and the customer adds the quillwork.